The operation of understanding is the fundamental methodical procedure of hermeneutics and is usually seen as contradiction to scientific explanation by the usage of mathematical models. Yet understanding is the basic way in which humans organize their everyday practice, namely by understanding other people and social situations. 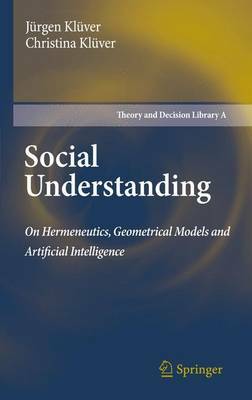 In this book the authors demonstrate how an integration of hermeneutical understanding and scientific explanation can be done via the construction of suited geometrical models with neural networks of processes of understanding. In this sense the authors develop some kind of mathematical hermeneutics. Connecting links for the integration of the two methodical poles are the developments of particular models of Artificial Intelligence (AI), which are able to perform certain tasks of understanding.